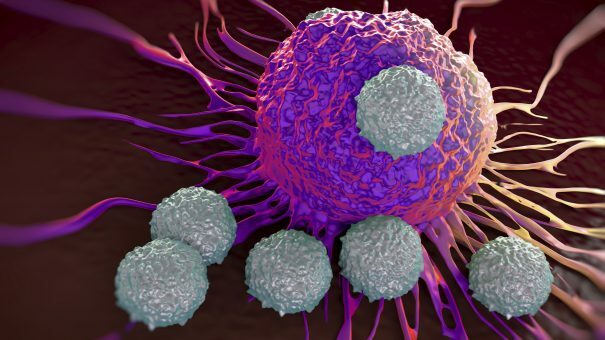 Getting CAR-T cells to work in solid tumours is proving a tough nut to crack – and a conference heard details of a cutting-edge approach that could inform clinical trials in the future. Kisaco Research’s CAR-T Congress EU, held in London, heard that a team from King’s College, London is working with potent CAR-T cells that react with a different target than those recently approved for use in blood cancer. John Maher, clinical senior lecturer of immunology at King’s College, London, and chief scientific officer at Leucid Bio, said the CAR-T targeting of a family of antigens known as ErbB is so powerful and reactive that he is only prepared to inject it directly into tumours to prevent reactions with healthy tissues. The CAR-T’s greatest strength is also its greatest weakness – ErbB is a family of receptors that includes HER-2 that is already targeted by established cancer therapies. But as these receptors can be expressed in healthy tissues elsewhere in the body there is a higher chance of off-target reactions. Indeed Maher cited one of the first attempts to trial a ErbB targeting CAR-T, which resulted in the death of the first patient it was tried on, just a few days after treatment, because of serious “on target off-tumour” effects. But by directly injecting the CAR-T into head and neck tumours Maher has been able to limit side effects in a phase I trial of 15 patients. Safety-wise the treatment seems to be viable, with patients being able to tolerate doses of up to a billion cells. This is very unusual given the well documented issues with response rates in patients treated with Keytruda alone, Maher said. “We are looking at some kind of combination – it could be in combination with chemotherapy or with a blockade,” he said.